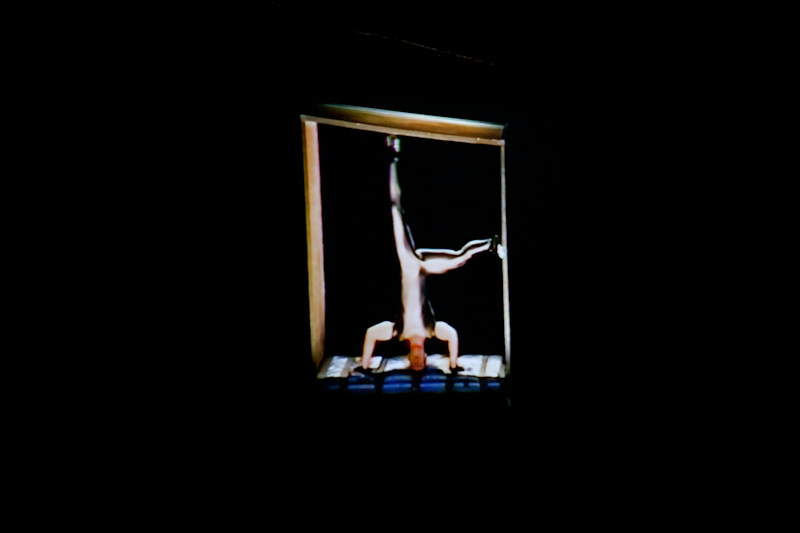 Projected onto the peeling walls of an industrial space displayed previous works of Mehmet Sanders choreographed pieces. There was no music to accompany his routines but only the sound of the impact that was made when person after person collided into surfaces horizontal and vertical, which to my horror even included each other. Followed by the thud of bone on bone collision were the audiences’ sympathised cries for the performers as each viewer felt the force of weight on them during the time of watching. I asked a member of the audience if this potentially lethal act could be called dance and she believed it could. Another pondered over this for longer and came to the conclusion that it was not dance… but movement. On further explanation she told me that it could only be movement because there was no narrative but instead it uses the vocabulary of the body. She was correct in thinking that this was the reason why it was so unlike any other dance and Sander had reasons behind his methods in choreography. He found that dance should not be about telling a story and being self-indulgent in the directors past and recreating events and issues that arose. Instead it should be a stripped back performance no genders, no music, no backup dancers and no drama, until all the layers are peeled back leaving only the human body. The benefit of this meant that he could focus less on portraying emotion and more on the different ways in which he could manipulate the human body and how many things he could achieve with one single form using the concepts of Isaac Newton and his methods of gravity, he could control the force in ways that left his dancers suspended in the air. This could be seen completely during his live performance of a piece called “IMPACT.” Four people who had only come together one week ago were dressed in black to remove all gender and were positioned under harsh lighting. Then the command “GO” was emitted and they would all dive onto the floor in unison or one after the other. The use of these declarative and controlled, strong and serious movements meant that it seemed more like military drills rather than a dance (which was probably influenced by Sanders time in a military environment) or rather a punishment for not climbing the gym rope in PE at school. However the practice to produce such a thing could be seen as almost a punishment in itself as injures were a common thing (there were 5 accidents) but Sander joked, “At least no one died.” He believes that if you don’t take the risk then you are never going to go anywhere. I feel that his risk taking has paid off for it has created a truly different meaning to the word dance and crafted an unclassified style that is still so unknown. It will be something wonderful if more dancers incorporated his ideas of time, space and gravity that he is so renowned for. Previous: Fierce Press Gang: Can you be too old for Fierce?